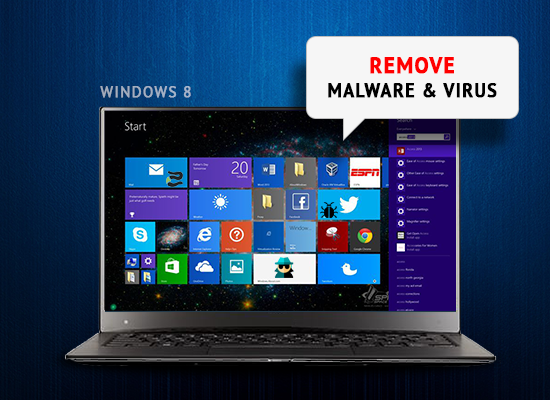 How To Remove Malware Virus From Windows 8? Malware virus threats are highly infectious and are capable enough to corrupt your data and damage your computer. Malware viruses silently intrude your computer and execute lots of malicious activities that make your computer nonresponsive. Most of the malware viruses look like a real and genuine program, even claiming to enhance your computer performance. It is advisable never to trust such software as they are designed only to trap innocent user like you. You can safely remove malware viruses from your Windows 8 computer by using the instructions given below. You will be prompted to choose an option, click on the Troubleshoot option when you are prompted and Select the Advanced Options. With safe mode enabled, you can prevent malware from spreading or causing further damage. Once you are aware of the malware infection on your computer, make sure to disconnect the internet connection to your computer. Since the hackers may have access to your personal information or may even be using your computer to attack other computers, it is advisable to make your computer offline by disconnecting the internet connection. After that, right-click on your Wireless Network Connection and select Disable. If you detect a suspicious application, you can use the process below to get rid of it. Free antivirus software can also help identify and remove malware. You can also use a good antivirus software such as the Comodo antivirus and run a full scan to detect and remove malware from your computer. In case of an organization, finding and removing malware is not easy. There might be multiple legacy endpoints/devices deployed at different locations. Due to that, conventional antivirus products are not a viable option. Comodo Advanced Endpoint Protection (AEP) is an ideal solution for such scenarios as it offers all-around protection across devices and OS platforms. Comodo AEP allows only known good files to run on a device with unlimited access.